Alan Hirsch and Lance Ford's book centres on basic Missional Practices- so that you can live out God's mission in the world, right here, right now! The book concerns everyday mission for every day people and it is framed around the idea of re-thinking ourselves to be a movement of the people of God- activating every domain of society. 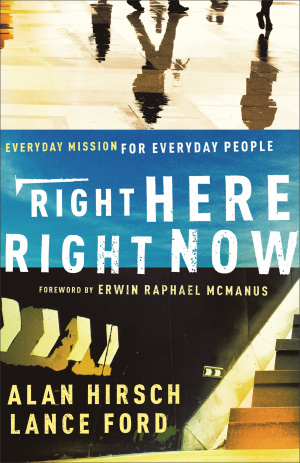 In 'Right Here Right Now,' the authors have delivered a book that is both inspiring and practical- so that you can live missionally regardless of your situation. The authors: Lance Ford has gained more than 20 years of experience as a pastor and church planter. Alan Hirsch is a founding director of Forge Mission Training Network and has written numerous books such as The Forgotten Ways and Untamed. Right Here, Right Now by Alan Hirsch; Lance Ford was published by Baker in February 2011 and is our 22323rd best seller. The ISBN for Right Here, Right Now is 9780801072239. At the heart of the book are two of its finest chapters, one on small groups “as communities of mission” and one on the practice of hospitality. Alan Hirsch concludes the book with a superb reflection on the sort of ecclesiology that undergirds the missiology and praxis developed over the course of the book. He concisely describes “a faithful expression of the church” as a covenanted community that is centred on Jesus and that nurtures the virtues of worship, discipleship and mission. Unlike other titles that just give analysis, Hirsch and Ford offer here real, viable solutions to these challenges that take the church community seriously and point us toward a deeply-rooted hope in Christ’s transforming power. Brilliant in content and communication: readable, clear and challenging – a certain classic! Got a question? No problem! Just click here to ask us about Right Here, Right Now.